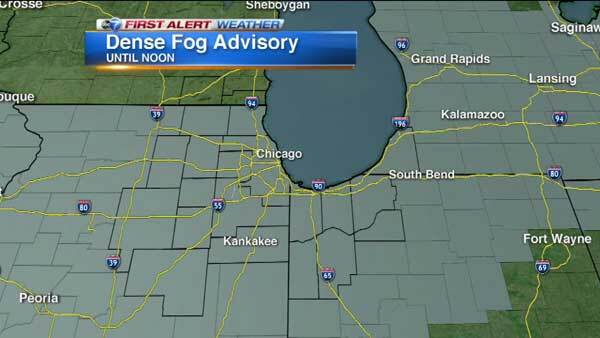 A Dense Fog Advisory is in effect for the Chicago area until noon Monday. CHICAGO (WLS) -- Widespread fog reduced visibility to less than half a mile for most of the area Monday morning. ABC7 Meteorologist Tracy Butler expects the fog to clear out slowly. The fog may linger after the advisory expires at noon. Drivers should reduce speed and keep their distance during the morning commute. The Chicago Department of Aviation said as of 7:30 a.m., O'Hare International Airport reported normal operations and Midway International Airport reported 45-minute delays due to fog. Butler said the Chicago area can look forward to mild weather this week. Average high temperatures will be in the mid-30s, which is above average for this time of year. The Chicago area will see sunshine and dry conditions Thursday afternoon. Rain chances increase after sunset and showers are expected late. High temperatures will be around 70 inland and cooler, in the mid-50s, by the lake.